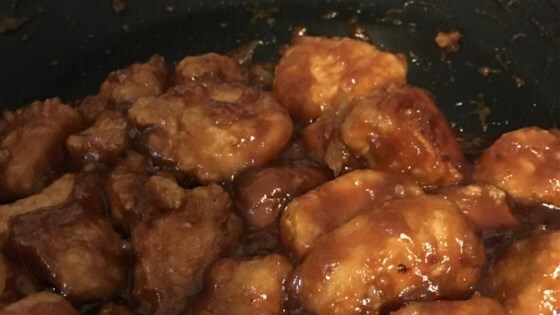 "For those who like spicy and sweet dishes, like General Tso's Chicken, this is for you. It's very tasty and easy." Mix the flour and salt in a large bowl; add chicken and toss to coat. Heat the oil in a large, deep skillet over medium-high heat; add the chicken a few pieces at a time; fry until golden and no longer pink at the bone and the juices run clear, 10 to 15 minutes. Remove chicken to a plate lined with paper towels to drain. Discard all but 2 tablespoons oil from the skillet and return to heat. Cook the ginger in the oil until fragrant, about 1 minute. Pour in the honey and cook another 1 minute. Whisk together the water, lemon juice, cornstarch, chili sauce, soy sauce, and red pepper flakes in a small bowl; mix into the honey and ginger; bring to a boil. Add the chicken to the sauce and stir to coat; cook until the chicken is heated through, about 3 minutes. Fold the green onions into the mixture and cook 1 minute more. Serve hot. Watch Chef John cook a simple but scrumptious chicken in tomatillo sauce. I didn't care for the sauce- it was sweet ,gooey and overpowered by the chili sauce.